Miranda and David move out of London into a beautiful country house with a magical garden. But Miranda insists on tottering across the wet lawn in kitten heels, David is never there, and the children won’t tear themselves away from the telly. Then an enigmatic Frenchman arrives. With the wisdom of nature he slowly begins to heal the past and the present. But who is he? His secret lies in the deepest recesses of the garden, for a garden, like love itself, can restore the human spirit not just season after season, but generation after generation. Santa Montefiore’s latest novel marks a new departure for this gifted writer. It celebrates the seductive beauty of the English countryside and the restorative powers of nature. Best of all, it offers the reader an epic love story at the heart of a novel of family life and the conflict between duty and desire. The summer after writing Sea of Lost Love I was sitting in our garden in Hampshire. I’m fortunate to have never really left home! Although I live in London during the week, I spend weekends and holidays in our cottage on my parents’ farm where I grew up with my brother and sister. My brother also has a cottage and our children (six between us) spend idyllic days playing in the woods, growing vegetables and flowers, catching butterflies and snails and feeding the birds. They relish the countryside and all the magic they find there. Anyway, I was sitting in our garden watching all six children clambering aboard the tractor that Simon, the gardener, was using the cut the lawns. They were roaring with laughter and Simon was driving on as if they weren’t there. I reflected on the sunflower seeds they had just planted with him in the greenhouse and the caterpillars he had helped our daughter find in the herbaceous border. I then thought of my parents, usually so busy with their own lives, grow inspired together as they wandered around the gardens discussing the things they could do with Simon now that they had a gardener. You see, Peter, the old gardener, had died years before and they hadn’t hired anyone to replace him. They had cut back the vegetable gardens and made things easier for themselves. I know my mother had dreamed of creating wonderful things, but couldn’t carry them out on her own. Then Simon came looking to rent one of the cottages. He was a game keeper and gardener. My parents asked him to do a few mornings for them. Mornings turned into days and soon he was working full time for all of us. It was fascinating to watch our focus move into the gardens and as our children grew older, to watch them follow in our footsteps and find all our old haunts to build camps in. Simon gave me the idea for The French Gardener and our children inspired me to write about the simple pleasures of Nature as their DVDs and Nintendo’s gathered dust, replaced by a more wholesome desire to play outside. I gave a talk at a literary lunch and afterwards a woman put up her hand and asked me if I would ever consider writing about something other than love. I found that question rather extraordinary. What else is there? Love is what Life is all about. Love is what motivates us. Love is what makes us all better human beings. Love inspires us to greatness. When faced with death no one thinks of anything else but the people they love. So, the answer is no. Love will always be at the very centre of my stories as it is at the very centre of my life. In the hallway I walk down every day to and from my office there is a bookshelf where people put copies of books they don’t need. There are shelves like that on every floor in the building and when visiting other departments you can sometimes find books you haven’t read and you get to take them home. It is like a free bookstore. That is how I found The French Gardener by Santa Montefiore. I love romance novels, gardening, handsome mysterious strangers, and anything to do with England and France. Throw in thwarted love, a mysterious notebook, a cheating husband, a selfish woman learning to love, a grand manor house, and quirky small-town characters and you had me at hello. 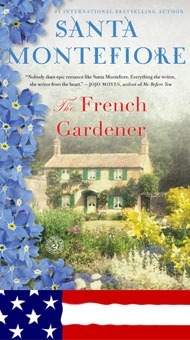 The French Gardener tells the tale of two women who live in the same house but thirty years apart. One, Ava Lightly, is an avid gardener, mother, and well-loved local who, with the help of a young Frenchman her husband pushes on her as payment for a business debt, turns the gardens of Hartington House from nothing to showstopping. The other woman, in present day, is Miranda Claybourne, a loving, but spoiled woman, who has been relocated from her beloved London of shopping and parties to the backwoods of Dorset because her son, Gus, has been kicked out of yet another school and they need to find somewhere he is not known. Miranda is the kind of woman who is overwhelmed—not in a good way—at the thought of making more than fish sticks for her children’s dinner. The story really begins when her husband, David, who spends the week in London at his high-powered banking job, tells her she needs a cook, housekeeper, and gardener and Miranda heads into town to find them. Montefiore manages to get three or four really good stories told at the same time, and each story is as rich as a full book. 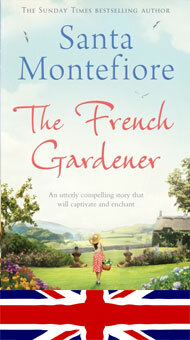 There is the mysterious French gardener who shows up to help Miranda bring Ava’s gardens back to life after years of neglect; there are the varied and wonderfully drawn local characters, each of whom weaves their magic on Miranda and the reader; there is the story of Ava and her family and what she sacrifices to protect them; and there is the story of the Claybournes who have lost their way and almost lose each other. At the heart of the story are Miranda—whose blossoming from removed socialite to warm local is so subtle and real you fall in love with her the way the townspeople do—and Ava’s garden, which opens hearts and sustains generations through its enduring beauty. I did not guess the end of this story at all and relished every detail Montefiore gave me about the house and the garden and the people. What a thrill it is to find and fall in love with an author who has written more than one book. I cannot wait to get my hands on Santa Montefiore’s other novels. These are the kind of books that you want to give yourself as a treat: a comfy chair, a glass of wine, and a trip wherever she wants to take you because you know the journey and the people you meet will be wonderful. Why did you decide to organize the novel by season? How do you think this organization will affect the reading of the book? What do you think the passing of seasons meant to your characters? The idea for this book came to me watching my children thriving in my parents’ garden on the farm where I grew up in Hampshire. I have always adored the countryside, but more than that I need it spiritually. Being essentially London children they began to plant vegetables and trees and watch them grow. They became more independent, more imaginative and surprisingly creative. I feel that all children should have access to such simple pleasures in a world where computer games and television dominate so many households. I decided to divide the book into seasons because of the garden theme, of course – I wanted a whole year to watch Jean-Paul’s garden grow – but also to reinforce the main theme of regeneration. The seasons return again year after year, Ava hands her knowledge and love of the garden to Jean-Paul who then passes them on to Miranda and her children, who will pass them onto their own children one day. My father grew up in the same house that I grew up in, where we now have a cottage. My children build camps in the same parts of the garden and woods and climb the same tree house that my father and I once climbed. Ava’s love is not dead, but will grow season after season in the garden she created. Can you give us some more insight into the poetic phrases that begin each chapter? How did you decide on these? How do you hope they set the tone for what follows in the chapter? Some of these are my own observations, others were given to me by Georgia Langton, a friend of my mother’s who’s a talented gardener. These are Ava’s words, because, on a deeper level, Ava’s spirit is still there in the garden – like nature we don’t die, but shed our bodies like leaves and flower again in spirit. Ava’s very much present, enjoying all the beauty of Nature. Would you give us some more background regarding the poem in the epilogue? Who do you see as a speaker? Who is the audience? I’m glad you asked this question! In my youth I wanted to be a singer songwriter. These are the words of a song I wrote aged 22 when a dear friend of mine was killed in a canoeing accident. It has a chorus but it wasn’t appropriate for the book. Like the phrases at the top of each chapter, these are Ava’s words from Spirit. They’re to Jean-Paul and they’re to my readers. You mention Georgia Langton of Dorset in your acknowledgements as inspiration, especially with regards to her garden. In what other ways is Georgia’s spirit written in to the book? Are any characters based on her? Are images of her garden available anywhere online? Georgia is a very exceptional, beautiful, talented woman. She embodies the best of British eccentricity in the most glorious way. Having known her as a child I went to see her while researching the book. She was a great inspiration to me and I did think of her as I created Ava. I’ve never seen anyone wear a dungarees with such style. Fortunately for her, I don’t know her well enough to base a character entirely on her, but I was inspired by her unconventional beauty, her animation, enthusiasm, joy and love. I haven’t looked for her on-line but she is a professional garden designer! Readers are always interested in which character an author aligns herself with. Is Miranda’s job as a writer and aspirations as a novelist a hint? Do you find it easiest to write about characters to whom you relate, or ones you feel distant from? Oddly enough, I didn’t identify at all with Miranda. I’m a country girl through and through! I identified with Ava a little, but I imagine some of me went into both. I write from my heart without really intellectualizing things a great deal. I write what feels right. I find it just as easy to write about someone like me as someone very unlike me – sometimes the characters who are least like me are the most fun! I can be anyone I want to be and for the duration of the book, live another life entirely! Infidelity abounds in the lives of the various characters in The French Gardener. Do you hope that readers will remain loyal to certain characters despite their flawed behavior? How do you see the affairs as differing from one another? Is one more forgivable than the next? To be honest, I don’t think of my reader at all while writing my books. I embark on an adventure for my own pleasure and work things out as I go along. I think infidelity is wrong only if it hurts other people. Many marriages are open and thrive on that type of freedom. So, I don’t judge other people. However, the characters I write about are there to be scrutinized. Ava falls in love with another man, proving that it is possible to love more than one man at the same time, but ultimately remains loyal to her husband. She sacrifices her own heart for her children, which is very admirable. I receive so many letters and emails from fans telling me of their secret affairs and loves that I realize this sort of sacrifice is more common than I thought. David’s affair is based on vanity and a yearning for excitement. There’s nothing very admirable about that, but it is very human. I think forgiveness is a very high quality and I like to feel that Miranda and David will heal and grow to enjoy a strong and lasting marriage. No one is perfect and I like my characters to be flawed because I want to watch them grow throughout the course of the novel. How do you hope readers will understand the “magic” of the garden at Hartington? Do you believe in real magic, or are you using the word figuratively? Can love make ordinary things and places magical? I really do believe in the magic of love and in the magic of nature. Ava and Jean-Paul pour all their love into the garden and create something magical. Jean-Paul teaches Miranda and her children to love Nature and they flourish. Love makes ordinary things special, it’s all about perception and focus. The old cliché that love can change the world is the truest thing ever said! The only trouble with most of us is that we love conditionally. True love is unconditional. In your biography on your website you say, “However much we try, time cannot be reversed. It changes us and those we were once close to.” Do you consider this to be a universal truth? How does this notion affect Jean-Paul and Ava? What can happen if we don’t allow time to change us and others? In my experience time does change us. That’s because life moulds us. It either makes us happy, giving, generous and wise, or embittered, regretful, jealous and unhappy. In the case of Jean-Paul and Ava, I really wanted them to get back together in the end, but I didn’t think it realistic. Their affair belongs in the past, when they shared that magical time, in those beautiful gardens, when they were both young. I’m not so sure that they would have recaptured that magic so many years later. Like an enchanted holiday, you return the year later to relive it again and find you can’t; the magic just isn’t there. The place is the same, the people the same, but something is missing. I think it’s often like that with love. I’m not saying that Jean-Paul’s love has diminished in any way, but he’s changed and had she not died, Ava would be different too – in ways too subtle to describe. Ava would want Jean-Paul to remember her as she was when she was at her most radiant. On another level, I don’t always like to tie up my endings with neat little bows, this ending, though perhaps not as Hollywood would write it, gives my reader something to think about when he reaches the end of the book. And there’s always Peach…. Miranda seems to be a city girl but finds her heart in the country. Where do you feel most at home? I adore my London life. I love my friends, the restaurants, shops, theatres and the social side of the city. But I need to return every weekend to the country where I see only my family. I feel at peace in the woods and gardens of my home, where we have a cottage, and fill up spiritually. Your books provide limitless fodder for reading group discussion. What can book club members look forward to next? The next book is called The Italian Matchmaker and is a sequel to Last Voyage of The Valentina, but can be read without reading the Valentina. It’s set on the Amalfi coast 30 years on from Valentina. 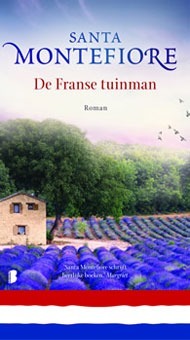 It’s very different from The French Gardener, but has a few similar themes like the struggle to find a balance between town and country and love, of course! The Italian Matchmaker holds a few surprises, but I can’t reveal them or I’ll spoil the book. However, the main theme is, to me, the most important theme of all…. Buy the ‘The French Gardener’ from CD WOW!